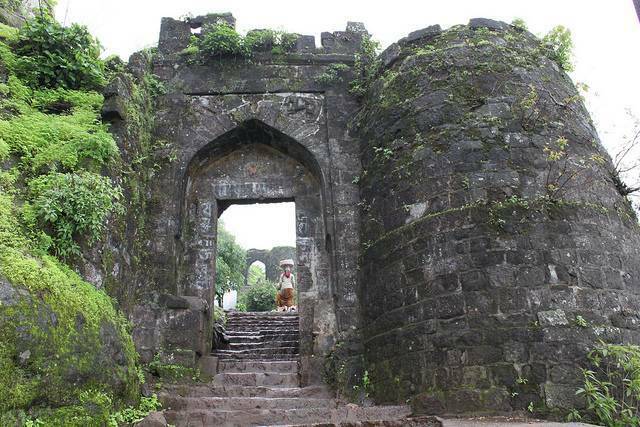 Sinhagad Fort or Lion’s fort is situated about 30 Kms from Pune. Housed on a hilltop at the height of 1312 meters / 4320 feet above sea level, it served as an ideal location strategically. Because of the steep hillsides of the Bhuleshwar range of Sahyadri Mountains, the Sinhagad Fort is virtually inaccessible. The fort originally named Kondana after the sage Kaundinya was probably built 2000 years ago as corroborated by the carvings on the temple caves. This place is famous for the battle of Sinhagad fought between Tanaji, a general of Shivaji and Shahji Bhonsle, commander of Ibrahim Adil Shah I. Tanaji died but his brother Suryaji captured the fort. The fort, which holds the memorials of Tanaji, has witnessed many attacks but the Marathas regularly gained control, until the British conquered in 1818. The original fort lies in ruins and the remnants serve as a training establishment for the National Defence Academy. Tourists like to picnic here while others enjoy the treks along the steep hillsides. The fort remains open all days of the week from 9 am to 6 pm in the evening. Rainy season (monsoon months) is the best time to visit the fort to see the lush green mountains all around. Fort can otherwise be visited both in summer and winter as well.